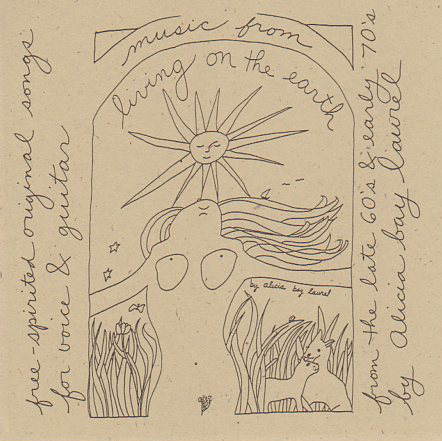 Posted on November 7, 2006 by Alicia Bay Laurel	in Blog. 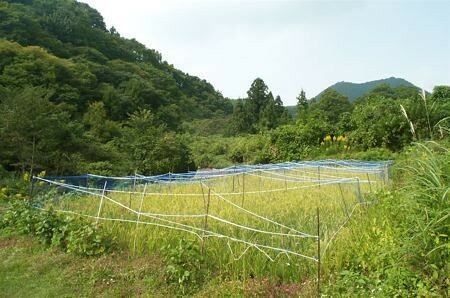 Our workshop guests were not to arrive until around noon, so we had the morning to visit the Permaculture Center and see the natural farming rice harvest in Fujino, 40 minutes away by car. 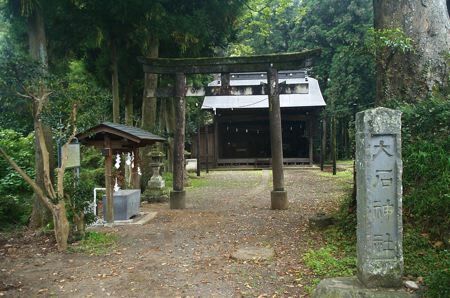 Across the road from the Permaculture Center, a magnificent old Shinto jinja. Main house at the Permaculture Center, which is completely built of recycled lumber and other sustainable materials, including rock and bamboo. 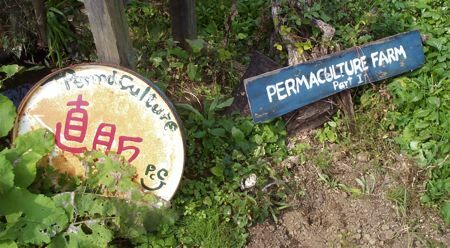 Three chefs at Permaculture Center. I enjoyed a slice of their whole grain, fruit and nut bread for breakfast. 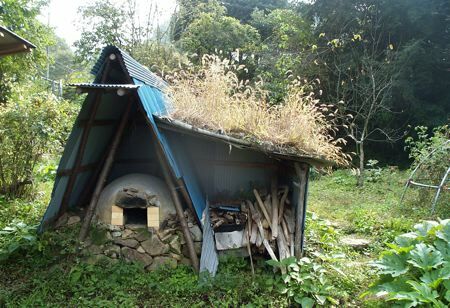 In Permaculture Center’s garden, a Roman style bread oven. 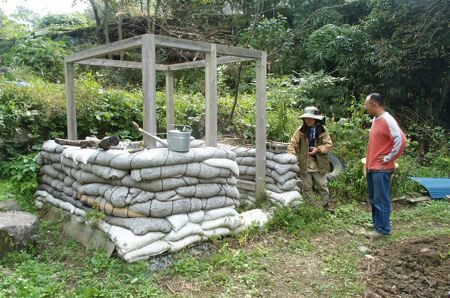 Also in the Permaculture Center’s garden, a chicken tractor, per the old permaculture saw, “Never use a machine to do what an animal will do willingly.” In this case, the job is fertilizing and aeriating the soil for a vegetable garden. 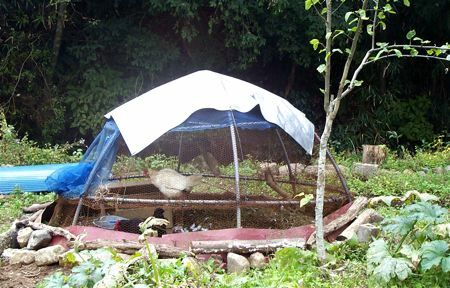 Two hens in a dome scratch the soil in search of worms and bugs to eat, eat the available weeds and their seeds, contribute eggs to the farm kitchen, and turn kitchen scraps and the insects the scraps attract attact into excellent fertilizer. After six weeks, chickens and their dome get another area of the garden upon which to work, and the earth under the dome is ready for an application of sheet mulch (sort of a lasagna of straw, newspaper, and green waste that gradually all melts together to form loamy soil together with the chicken manure underneath). Once sheet mulch is applied, the soil is never plowed, so that the various organisms that live in it can continue to live and benefit the soil. The farmers make holes in the mulch and place young vegetable plants in them. 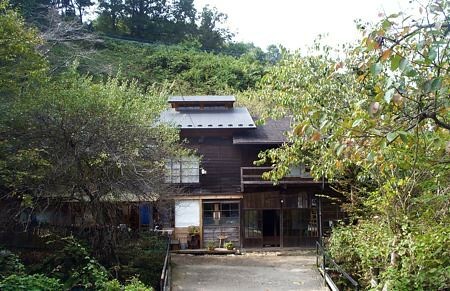 Next we drive over to the Steiner School (often called Waldorf School in the USA), located in a former public school that fell into disuse as younger people moved away from Fujino. 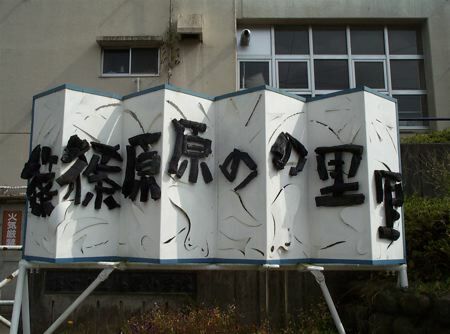 The beautiful sign is lettered in charcoal made by the children at the school under the tutelage of an artist friend of Setsuko’s. Charcoal’s uses are many: as an art medium, as a filter for drinking water, as an antidote for food poisoning, as a food-cooking fuel. 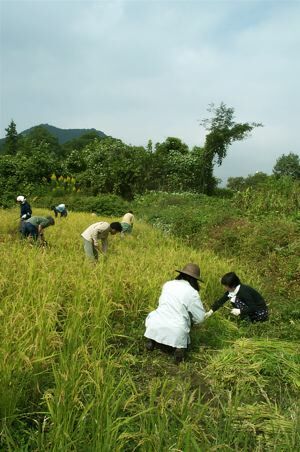 The rice field prior to harvest. 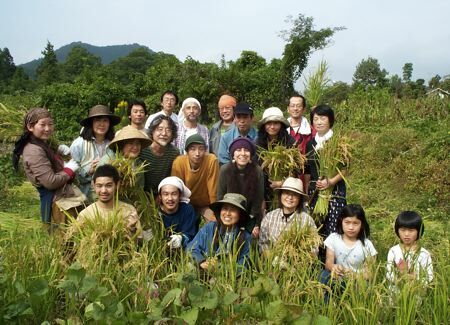 Many rice fields in Fujino have gone to weeds because of the exodus to the cities of younger people. The elders in the village don’t have the strength to work them, so the artists who came from the city are renting the rice fields from the village elders, clearing them of weeds, and planting rice according to the principles of Natural Farming developed by Masanobu Fukuoka, a former agricultural inspector turned rice farmer and researcher, later the author of the bestselling One Straw Revolution. The group of artists, social workers, teachers and other former city folk who have been working the field all year gather for the harvest. 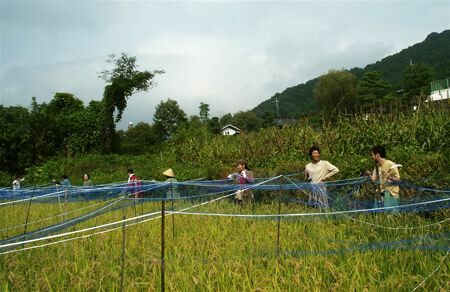 First they remove the net that protected the ripe grain from birds. Everywhere fireflies float above the rice. Once the netting and poles are removed, the natural farmers cut sheaves of rice stalks with hand scythes and lay them in piles. I got to try my hand at this. After harvesting the field, the natural farmers will hold a party and music fest. We are invited, but I must get back to Doshi to participate in the workshop. I’m the one in the purple hat, Setsuko is in front of me, and her husband, Jun is behind me.